Terror Expert - "Prepare Yourself" - Fighting ISIS Now "Up To American People"
18 U.S. Code § 2381 - Treason states - "Whoever, owing allegiance to the United States, levies war against them or adheres to their enemies, giving them aid and comfort within the United States or elsewhere, is guilty of treason and shall suffer death, or shall be imprisoned not less than five years and fined under this title but not less than $10,000; and shall be incapable of holding any office under the United States. In light of the Paris attacks by ISIS on November 13th, 2015 and the fact that in the last 18 months, unbeknownst to the American people, over 70 arrests have been made over ISIS terror plots to be carried out on American soil, which includes the detainment and arrest of refugees the U.S. has given safe haven and then "turned to terror," why are we as a nation even having a discussion about allowing up to 100,000 refugees into the country per year by 2017? On Friday the 13th, ISIS made a laughing stock out of Barack Obama who had just publicly declared them "contained." Just yesterday, hours after Obama decided to taunt critics of his Syrian refugee policy by stating "Apparently they are scared of widows and orphans coming into the United States of America," a "female terrorist wearing a suicide vest"blew herself up and "another jihadi was killed by a grenade during a six-hour siege on a flat where police believe the Paris massacres mastermind and six other ISIS terrorists were hiding,"
Once again ISIS makes a mockery of Obama's assertions. Two days ago, Peter Hoekstra, former chairman of the House Permanent Select Committee on Intelligence, exposed one of the biggest lies being told by the Obama adminstration after Deputy National Security Adviser Ben Rhodes claimed the U.S. had a "very extensive screening procedures for all Syrian refugees who would come to the United States." Governors across the U.S. are objecting to Obama unilaterally deciding to import "refugees," along with ISIS terrosists into the their states, with one GOP official in Tennessee actually suggesting "National Guard to round up any Syrian refugees who have recently settled in the state and to stop any additional Syrian refugees from entering Tennessee," according to The Tennessean. On November 13, 2015, directly after the Paris terror attacks, Stefan Stanford asked if ISIS was now spread out all across America ready to unleash their deadly brand of hell upon America? This was followed up with a map of known cities within the United States that had been publicly targeted by ISIS. We now see the very same warnings ANP and others have been giving for months, coming from the FBI as they prepare for a "new round of threats rising" during the holiday season, admitting they do not have the tools to cope with the threats. Bureau officials are deeply worried they don’t have enough resources to track a growing number of radicalized Americans inspired by the Islamic State, with more possibly entering as President Obama opens the borders to thousands of Syrian refugees. 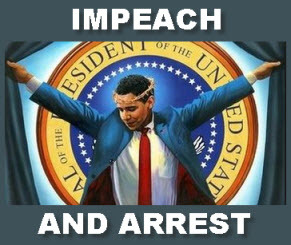 Exactly.... Barack Obama has betrayed his oath of office, the nation and every single citizen within. 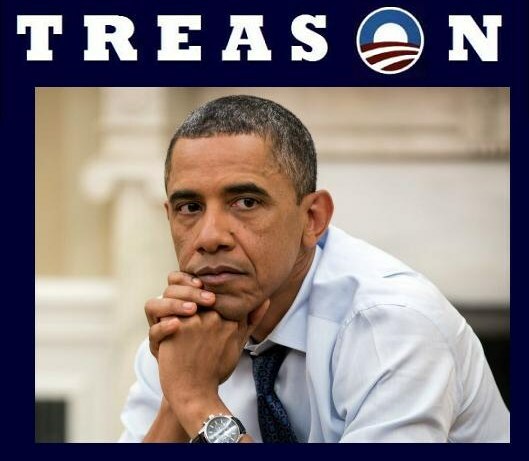 Treason, as defined by the law, is giving America's enemies "aid and comfort within the United States or elsewhere," and we have to ask, after multiple arrests by ISIS plotters in the U.S., that were brought and given "aid and comfort within America" by Barack Obama and he is still bringing them into the country... is that not the very definition of the Treason law code? Ladies and gentlemen, when I said the national discussion should not be whether or not to bring Syrian refugees into America, which have already been proven to have been infiltrated by ISIS members, I meant it... the national discussion now should be why Congress is not filing charges of Treason against Barack Obama? He has crossed the line in the sand, he is opposed by the majority of Americans, the majority of our elected Representatives, and the "traitor-in-chief" should be brought up on charges, tried and arrested for Treason against the United States of America. On November 16, 2016, Dr. Sebastian Gorka, distinguished chair of military theory at Marine Corps University joined Judge Jeanine Pirro, tells us that fighting ISIS is now up to the American people because the Obama administration is not going to do it. His suggestions include "people should be on a “heightened level” of alert while out in public," "reporting any suspicious activity immediately to the authorities," "find out if their local counties will begin accepting new refugees," and "Prepare yourself. Educate your loved ones." Gorka concluded "You must bear the responsibility for yourself until we have a new commander-in-chief." It is a very sad day indeed, when a terror expert has to warn Americans that fighting a deadly terror group is now up to them because their president refuses to do so.